There are a number of basic gardening tools which form the bedrock of every gardener’s collection. One of the most important is a good quality border fork, and all keen gardeners are aware of the importance of having one to keep their lawn and its edges looking its best throughout the year. 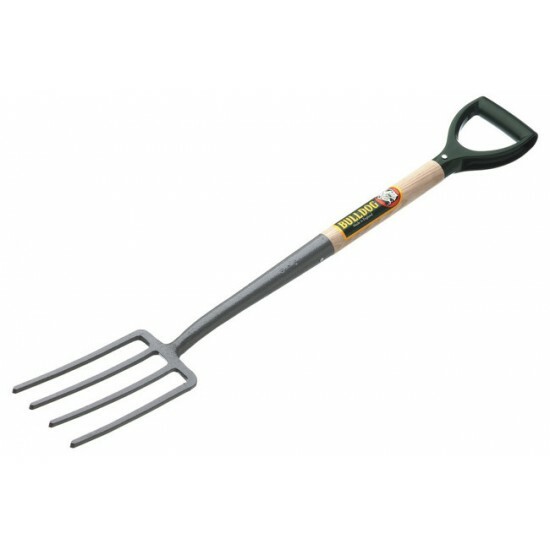 When only UK-made quality will do, this four-pronged border fork from the reliable Bulldog brand is the ideal choice. Made from excellent, durable materials, this garden border fork is a traditional choice that is sure to stand the test of time. Featuring a strong shaft that is made from ash wood and a solid forged head that guarantees resilience and robustness whatever the application, this tool is an asset for any keen amateur or professional gardener. The handle is made from plastic and features a D grip for extra comfort and ease of use. The handle measures 28 inches in length while the head measures 9 inches x 5.5 inches – an excellent size for maximum productivity and functionality. Forged in Britain, this classic garden fork has been manufactured to the very highest standards and will keep all of your borders looking fantastic all year round.